First Bing, then Google, now Spotify. The popular music streaming service is tweaking its desktop app to display song lyrics as you listen. 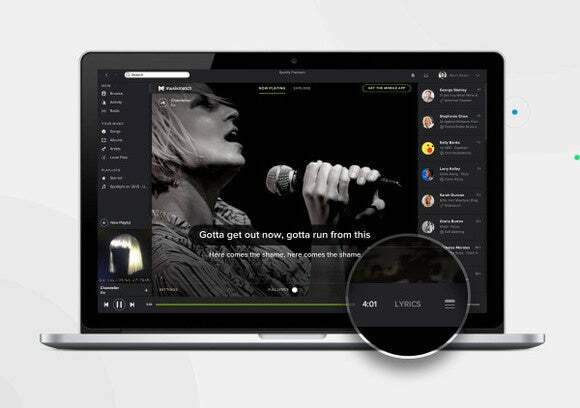 Spotify's new music lyrics feature is powered by Musixmatch, one of the most popular apps in Spotify's catalog. The streaming service is also adding new social features, including a chart showing the most shared tracks on Spotify. Why this matters: Beyond offering a big catalog, Spotify is all about making music more social. The viral charts are a way of showing how active song sharing is on Spotify, while lyrics that make it easier to sing along offer a clear social benefit. Music streaming is becoming a cutthroat business these days with Apple, Google, and Microsoft all getting in on the game. To stand out you need to offer something original and Spotify hitched its wagon to social features a long time ago. Based on Spotify's promotional video the new lyrics feature looks exactly like what you get with the Musixmatch app. When the new feature rolls out to your desktop you'll see a Lyrics button at the bottom of the app, next to the song's timer. When the lyric display is active, song lyrics will display for the current song in the main window of Spotify. You'll also get a slideshow of background images related to the artist. Lyrics will also be integrated into Spotify's search feature so if all you can remember of a song is the opening verse or the chorus you'll still be able to find it. The new Spotify update will also bring some more social features to the music sharing service. Spotify says it's tweaked the friend feed so you can better see what your friends are listening to, but if you ask me it looks more or less the same as what we've got now. Spotify is also adding a new "daily viral chart" that will show you a list of the most shared tracks around the world and in the U.S. Spotify already shows you lists of the most oft-played tracks on Spotify, but the most shared songs is an interesting addition and could help you spot new songs before they turn into hits. Song lyrics and the new social features will roll out over the coming weeks to desktop users.